A more detailed map can be found via StreetMap or Multimap. The venue is easy to access by car from most major routes. It is also close to Sandal and Agbrigg station and several bus routes, making it easy to access by train and bus from the centre of Wakefield and from Leeds, Sheffield, Doncaster and beyond. 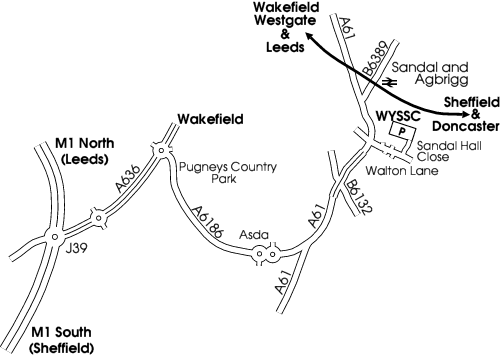 Leave the motorway at junction 39, and take the A636 towards Wakefield. Go straight on at the first roundabout, continuing on the A636 dual carriageway. At the next roundabout, turn right (fourth exit), onto the A6180 (Asdale Road). Follow this single carriageway road past the lake (Pugneys Country Park) and Asda on your left. Get into the right-hand lane and go straight on at both mini-roundabouts at the entrance to the retail park. Carry straight on at the first junction with traffic lights, heading towards Wakefield on the A61. Carry straight on at the next junction with traffic lights, with the Three Houses Inn on your right. As you crest a gentle hill, get into the right-hand lane on the dual carriageway ready for a right-hand turn. At the next junction with traffic lights, turn right into Walton Lane. After approximately 300 yards, turn left into Sandal Hall Close, (signposted WYS&SC on the right-hand side of Walton Lane). Turn left into the car park at the end of the close, and the clubhouse is located in the far corner. Enter the 30mph zone at Newmillerdam with the St. Pierre Hotel on your right, and continue past the lake and Toby Carvery on your right towards Wakefield. Bear right at the first junction with traffic lights, continuing towards Wakefield on the A61. Carry straight on at the next junction with traffic lights, with the Three Houses pub on your right. As you crest the gentle hill, get into the right-hand lane of the dual carriageway ready for a right-hand turn. After 350 yards, turn left into Sandal Hall Close, (signposted WYS&SC on the right-hand side of Walton Lane). After entering the 30mph zone and passing under a pair of railway bridges, continue over a junction with traffic lights towards Wakefield until the road becomes dual carriageway. Take the left lane, and immediately after a gently hump-backed bridge over the canal, turn sharp left at a main junction with traffic lights - not signposted but this is the A61 Barnsley Road. Go back over the canal (another gently hump-backed bridge), and continue past a short dual carriageway section. Go under a railway bridge, and past “Harratts Volvo” and “Guy Salmon Land Rover” on your left. At the next junction with traffic lights turn left into Walton Lane. After 350 yards, turn left into Sandal Hall Close (signposted WYS&SC on the right-hand side of Walton Lane). On entering the city, follow signs for A61 Barnsley. On crossing the river bridge, where the A638 for Doncaster continues straight on, bear right on the A61 for Barnsley. Go over the canal (a gently hump-backed bridge), and continue past a short dual carriageway section. At the next junction with traffic lights, turn left into Walton Lane. 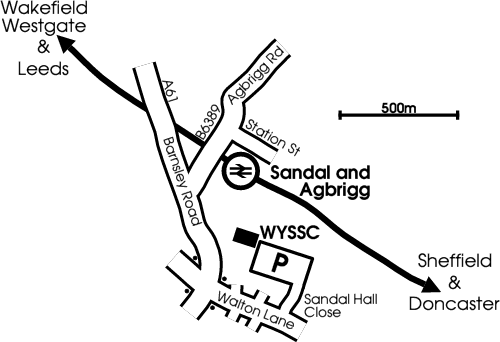 By train, Sandal and Agbrigg station is a 15 minute walk from the WYS&SC, with regular services to Leeds and Wakefield Westgate, Sheffield and Doncaster throughout the evening. Details of train times can be found on the National Rail and West Yorkshire Metro websites. By bus, the venue is around 10 minutes from the centre of Wakefield, with regular services to and from Wakefield Bus Station. Routes 194, 195 and 196 depart from Stand 12 at the Bus Station, and stop in Walton Lane; routes 59 and 110 depart from stands 18 and 4 respectively, and stop in Barnsley Road; route 485 departs from stand 13 and serves Sandal and Agbrigg station. Details of routes and times can be found on the West Yorkshire Metro website. Although these public transport details are given in good faith, we recommend that visitors check the West Yorkshire Metro website before travelling for any changes or last minute service alterations which may affect the journey.